A guide to choosing the best weed scale – from understanding weed scale sizes and functions to calibrating the devices to maintain accuracy. At some point in time, many a cannabis connoisseur decides that it’s time to purchase a weed scale. Maybe you’re a budding (no pun intended) entrepreneur looking to start a little business on the side. Perhaps you’re running a full-blown cannabusiness. Or maybe you just buy a lot of weed and want to ensure that your dealer isn’t shorting you. No matter what, it’s pretty handy to have weed scales around. If you’re investing in marijuana scales for the first time, you likely have lots of questions. How do I choose the best scale for weed? Where can I buy a weed scale? No worries! This buyer’s guide will walk you through all the basics of finding the best weed scale – from reviews of the most reputable weed scales to things to keep in mind when choosing the best scales for your purposes, as well as how to calibrate your device. By the time you finish reading up, you’ll be a near expert in the world of weed scales. Whether you fly solo or have a full-blown cannabusiness, weed scales are a handy tool to have around. For those who already have a bit of weed scale knowledge, we’ll get right to the list of reviews of the marijuana scales that are currently regarded as some of the best on the market. If you’d like to know more about choosing the best weed scale for your purposes, skip down to our How to Choose section below, then scroll back up to peruse the reviews. That section will help you understand how to pick the best weed scale, as well as where to buy weed scales online. Our 2019 Buyer’s Guide details some of the best weed scales currently on the market. When you need your scales to be convenient and portable, a pocket marijuana scale is the way to go. Just because you opt for portability doesn’t mean you have to sacrifice precision and features; by choosing reputable brands, you’ll be able to find a weed weight scale that’s both compact and able to accurately measure small items. Pocket scales are also among some of the most cheap weed scales, so they’re excellent for the budget-conscious. Scales aren’t just novelty items for ProScale. As suggested by their name, creating measuring systems is all they do. Owned by Washington-based Accurate Technology, the brand has been around since 1989. 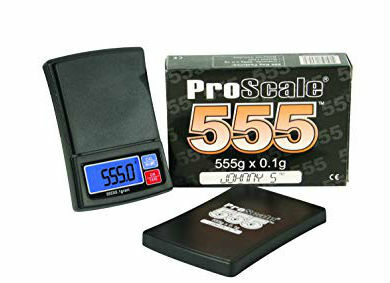 Their ProScale555 is a top-notch choice for customers shopping for the best digital scale for weed. The ProScale555 is perfect for on-the-go weighing, as it measures in at just 90 x 61 x 18mm. Not only is it small; it’s incredibly thin. Its cover protects the scale and can be removed for use as a tray; simply set the tray on the scale plate, hit the Tare function key, and the scale will zero out and is ready to measure. The ProScale555 can measure in grams (with up to .1 gram precision), ounces, pennyweights, and grains. In addition to the full-capacity tare feature, this marijuana scale has a backlit LCD display and will automatically turn off after 30 seconds. It is powered by two AAA batteries (included with purchase). The ProScale555 is covered by a 5-year manufacturer’s warranty. My Weigh deems themselves “the best digital scales on earth,” and based the reputation of their entire line of products, we’re not inclined to argue with their claims of quality. 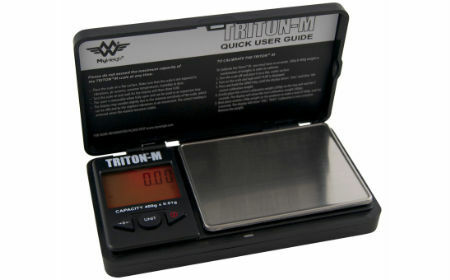 Compact and convenient, the MyWeigh Triton 2 is a portable and accurate scale for weed. Measuring approximately 74 x 23 x 125 mm, it’s an incredibly small device. Its precision runs to 0.01 of a gram and they can measure up to 400 grams. The MyWeigh Triton 2 features a removable weed scale cover that doubles as an expansion tray, giving you more flexibility. When you’re finished with it, wipe it off, put the tray back into place, and fold it down to protect the scale itself. It has a nifty red backlit display and runs on two AAA batteries. 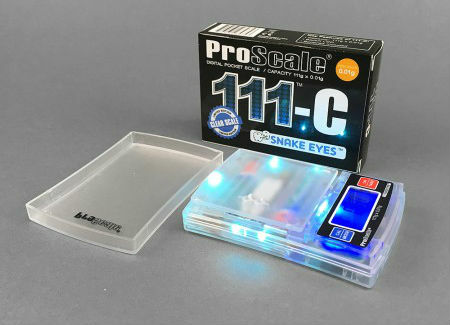 In the third generation of their 111-C Digital Pocket Scale (also known as “snake eyes” weed scales), ProScale addressed some of the drawbacks of previous models. Now even more reliable, this scale has an incredibly cool translucent body that allows you to see right into its inner workings. The backlit LCD screen adds to its overall appeal, and it features four weighing modes and a 30-second auto-off function. The tare function of the ProScale 111-C allows you to place something on the plate (a rolling paper, its removable lid (which doubles as a tray), or piece of parchment paper, for example) and zero the scale out top prepare for weighing. It can weigh in grams, ounces, carats, and grains. The capacity of the ProScale 111-C is 111 grams, and it’s precise to 0.01 of a gram. As with all of their scales, Accurate Technology (the company behind the ProScale brand) offers a 5-year manufacturer’s warranty. For those in the market for weed scales that can hold a bit more weight and are good for all-around use, but aren’t necessarily as tiny as pocket scales, medium-duty scales are a great choice. These marijuana scales are still small enough to tote around, but they can hold a bit more weight than their pocket counterparts. Even so, it’s still important not to overload their capacity. A truly high-quality weed scale, the ProScale LC300 Digital Scale is made of attractive and durable metal. It features a cover/expansion tray and a huge LCD screen. It’s not only easy to read the screen; the ProScale LC300 is also user-friendly, with four function buttons that allow you to quickly power up/down, switch between modes, and turn the light on/off. This weed scale also has a generous-generously-sized weighing platform (120 x 72mm). The LC300 can measure up to 300 grams and is accurate down to 0.01 of a gram. It also has a tare mode for extra weighing flexibility. 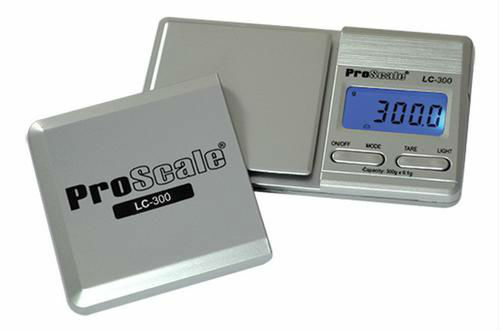 The Proscale LC300 marijuana scale operates on AAA batteries and comes with a 5-year manufacturer’s warranty. A removable cover that doubles as an expansion tray is an excellent feature on smaller weed scales, and you’ll find that feature (among many others) on the Jennings JZ115. Once you’ve got the tray or the (57 x 57 mm) weighing surface loaded with herb, you’ll be able to note the readout via the backlit LCD display. 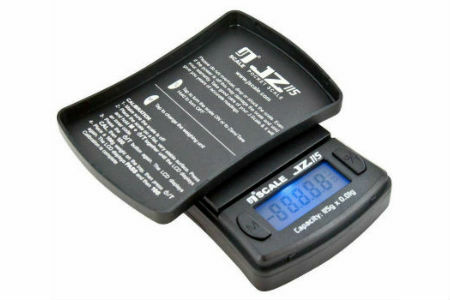 The Jennings JZ115 marijuana scale has a 115 gram capacity and a 0.01 gram precision. It measures in grams, ounces, troy ounces, and pennyweights.The two-button operation make it extremely user-friendly, but there are also four weighing modes for added flexibility. The scale will turn off to conserve battery life after 60 seconds. It runs on two (included) AA batteries. Jennings offers a lengthy 20-year manufacturer’s warranty. Another option on any well-rounded “Best Digital Scale for Weed” list is the Triton T2 Digital Scale. Cannabis connoisseurs like this one because of its ease of use, affordability, and portability. The protective tray stays in place due to a magnetic closure and comes off to use as an expansion weighing tray. Its dimensions are 80 x 150 x 20mm, with a weighing surface of approximately 80 x 60 mm. This weed scale displays in grams, ounces, pennyweights, and troy ounces, and can weigh amounts up to 550 grams. Its accuracy runs within 0.1 grams. 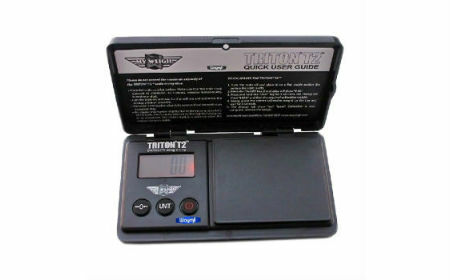 The Triton T2 has a tare feature, and its LCD screen is large and easily read. The ribbed case makes it easy to carry around and takes the quality to another level. It runs on two AAA batteries (which are included). Some situations require more capacity than pocket or medium-duty weed scales. In these cases, a heavy-duty set of marijuana scales is useful. Many of these can also double as kitchen scales, so in addition to weighing your herb, they can help you measure out dry goods for baking (marijuana-infused cookies or brownies, perhaps?). 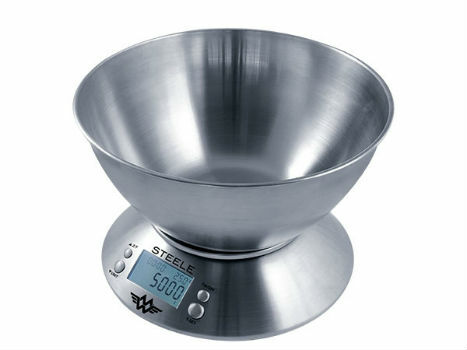 A truly high-quality (and high-capacity) marijuana scale, the MyWeigh Steele comes with an easy-to-clean stainless steel bowl. To weigh flat items, the bowl is removable. It has a whopping 5 kg capacity and measures in grams, kilograms, ounces, and pounds. This is not only an excellent weed scale; it also doubles as a kitchen scale (should you need to measure flour to bake up a giant batch of THC-infused brownies or cookies). The features of the MyWeigh Steele leave nothing to be desired, with a full tare function, a large white backlit display, as well as a timer and a thermometer. It runs on two AAA batteries. The entire scale measures approximately 224 x 104 x 213 mm. The MyWeigh Steele comes with a 30-year manufacturer’s warranty. Stealth scales are useful for keeping around when you need a weed scale that can fly under the radar. Besides this, to be honest, some of them are simply fun to have and show off. Here are some of our favorites that are currently on the market. 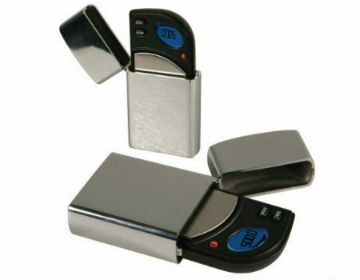 It’s pretty common to find people carrying butane lighters around in their pockets, and the MyWeigh Lighter Digital Scale looks just like just that – a metal lighter. However, when you flip it open, it contains a tiny digital scale that’s perfect for weighing items up to 500 grams (an impressive capacity for such a small scale, in our opinion). It features a overload protection meter for extra safety. It’s precise up to 0.1 grams and measures in grams, ounces, pennyweights, troy ounces. The MyWeigh Lighter Digital Scale runs on a small 2032 lithium battery. You should have no worries toting it around and using it all the time, as MyWeigh covers it with a 30-year manufacturer’s warranty. When it’s sitting on a shelf or coffee table, this device appears to be nothing more than a regular (and functional) ashtray. Lift off the top cover, however, and it’s a durable scale to weigh weed. It’s a sleek and useful little scale that features a capacity of 550 grams. With precision measurements that run up to 0.1 of a gram, it’s a truly functional stealth weed scale. 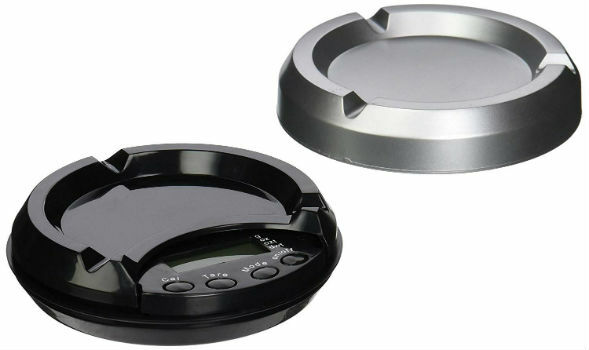 The ProScale Ashtray Digital Scale has a tare function and measures in grams, ounces, pennyweight, and troy ounces. It measures approximately 30 x 41 x 109 mm in size and is covered by a 5-year manufacturer’s warranty. With so many different models to choose from, it can feel rather intimidating when you’re shopping for weed scales for the first time. When considering different herb scales, there are a few different options to keep in mind. These will help you determine which weed scale is best for your purposes. Do you need to weigh herb or other items the go, or will your marijuana scales primarily be used at home? This should be the first deciding factor in whether you choose something portable like pocket weed scales or a medium-duty model that’s slightly larger. In addition to the size of the scales themselves, consider the average weight of the substances you’ll be weighing. Some are tiny and can only measure small amounts – up to 20 grams, for example – while others can measure 500 grams. (One U.S. ounce is 28 grams, for reference.) If you need to weigh heavier items or larger batches, the smallest scales won’t have the capacity to do the job. Depending on how you’d like to use your weed scales, you may need to choose according to measurement precision. Some models can measure down to a tenth of a gram, while others are even more precise – measuring to one-hundredth of a gram. 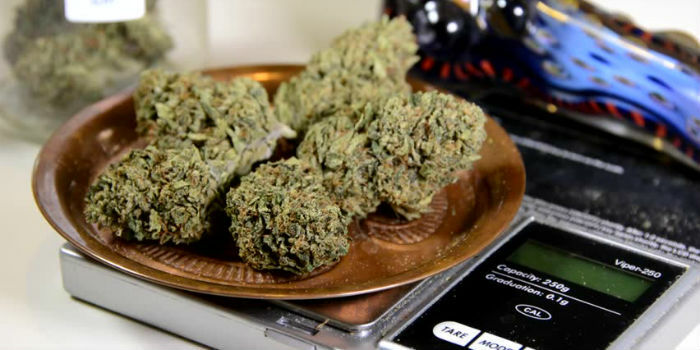 One ounce, for example, is 28.349 grams, so if you’d like to accurately measure out grams, it’s essential to choose a marijuana scale with the ability to do so. If you plan to use your weed scale for commercial purposes, it should have a certification from the NTEP (National Type Evaluation Program). Put in place by the National Conference on Weights and Measures, NTEP specifications cover the accuracy of scales, their capacity, and even how they’re affected by shifts in temperature. Different marijuana scales will also have different functions. These can include the tare function button where you can put a rolling paper, piece of parchment, or tray on the scale, hit the tare button, and it will zero out even with the paper or tray on it in order to accurately measure whatever you place on it next. You can also usually switch between different units of measurement to quickly perform conversions. With different sizes, weight capacities, and features, there’s a weed scale to suit every purpose. If you’re planning to upgrade your current herb scales to a new model or are adding to your weed scale collection, you may already be up to speed on everything there is to know about how to choose and use them. Others may have questions – and here are some of the ones that are most frequently asked. Where can I buy a weed scale? One of the first things people wonder is where to buy a scale for weed. While brick-and-mortar stores sell some scales, it’s highly recommended to shop online to find the best scales for weed. This is because online retailers tend to offers the best selection of specific styles of weed scales as well as ones with specific functions. With all the online competition, it can be hard to know which websites have the best products. Over the years, Rolling Paper Depot and Hippie Butler have emerged as two of the top online shops for weed scales and other accessories. They’re reputable, have a nice selection, reasonable prices, and great customer service – all factors to look for when shopping for weed-related items online. 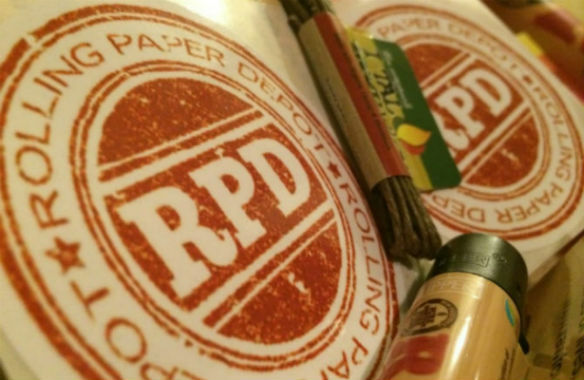 Rolling Paper Depot has an excellent selection of weed scales and other useful items. Hippie Butler is a well-known and reputable resource for weed scales. How much is a weed scale? Weed scale prices can range from affordable to expensive depending on their quality and features. For those who are looking for entry-level models, it’s easy to find cheap weed scales that are functional. For scales that will be longer-lasting and have a long list of features, prepare to spend a bit more. How do I choose the best weed scale? Choosing the best weed scale will depend on the average size of items you’d like to weigh, as well as whether or not you’d like to easily take your scales on the go. It’s also important to consider marijuana scale factors such as measurement precision, scale certifications, and features. How popular are dry herb scales? When they first start out, many cannabis novices find themselves focused on other items and accessories found in online headshops. Even the most basic of cannabis paraphernalia will typically include a supply of high-quality rolling papers, and eventually, most folks discover that investing in a weed grinder eliminates the need for them to break their bud into tiny bits by hand. As time goes on, however, people often tire of playing guessing games and attempting to eyeball an ounce or an eighth of flower. Since you can buy a decent set of weed scales for a relatively low price, it makes sense to have one around. How do I calibrate my weed scale? When using (and especially calibrating) a marijuana scale, it’s best to place a mouse pad underneath it to dampen any vibrations that may interfere with it. Make sure the scale is clean and press the tare button to zero the scale out, then follow the manufacturer’s instructions to put it in calibration mode and find out what its specific calibration weight should be. Then place an item on the scale – either a calibration weight or any item of which you know the exact weight. Set the scale to the appropriate weight to calibrate it. Finally, turn the scale off and wait approximately a minute before powering it back up to test its accuracy. Which Weed Scale Is Best for You? There is no “one best weed scale;” what works well for one person may not be helpful to someone else. To choose from among the many weed scales on the market in 2019, it’s important to consider your specific needs and goals in buying a scale. Whether you need something that’s portable and pocket-friendly or durable and able to hold up to more substantial amounts of weight, there are plenty of marijuana scale options available in a variety of shapes and sizes! Check out all the different models of scales here: Weed Scales – Buy Online. Selling marijuana, like most things in America, has been and still is a scam hoisted on many buyers. People that sell pot want you to think that the fresher the better – sticky, smelly and moist is what you want. Dank! Right? Wrong. Fresher means for the most part wetter. Water weighs 8.34 lbs. per gallon at around 65 degs. The wetter your pot is the more it weighs. Curing pot properly means giving it time to dry properly and to let less desirable and harsher tasting chemicals dissipate and/or oxidize. The scent of marijuana, however pleasant has very little to do with its potency. Unscrupulous sellers try to sell pot that is as fresh as possible because it still holds a lot of water, going as far as to add water to fully dried pot and microwaving quickly to rehydrate. Adding all that weigh prior to pulling out their cute little digital weed scales and setting your cost per gram, 1/4, 1/2, full ounce or pound. It is worse in the new commercial atmosphere where you never even see the pot weighed. Just pick a little sealed bag by strain and pay whatever price is stamped on the bag. What you find in that bag is pot that has been so molested and trimmed and generally fucked with that it is a mere shadow of what it would have been if cured properly. The weight is arbitrary when the pot hasn’t fully cured, regardless of what type of weed scale you use.